Cut the tops off the capsicums and remove seeds. Place capsicums with the open side of the capsicum facing down in a microwave safe glass dish with about 2cm water. Cover tightly with cling wrap and cook in the microwave for 5-8 minutes, or until capsicums have softened. Meanwhile, in a large non-stick frying pan sauté onion for 2-3 minutes over medium heat. Add chicken, chilli powder, cumin and paprika, and sauté until chicken is cooked through, about 5 minutes. Add quinoa & rice mix, diced tomato and corn kernels. Bring to the boil, and then reduce heat to low and simmer for 5 minutes. Combine, spinach, cucumber, cherry tomatoes, feta and balsamic glaze in a salad bowl. 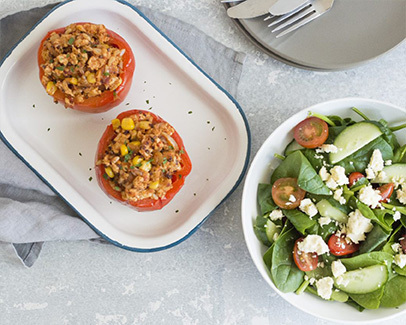 Fill capsicums with chicken and quinoa and brown rice mix and serve with green salad. Tip: Roasted capsicums are delicious slow roasted in the oven. Skip step 1 and bake in the oven for 30-35 minutes.